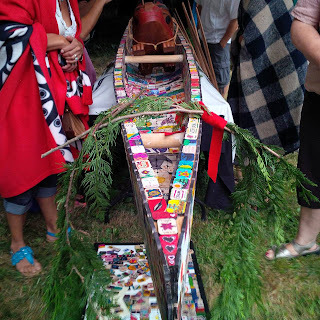 Project of Heart tiles were the inspiration for a jaw-droppingly beautiful ceremonial canoe recently unveiled in Langley, BC. More on the story — along with more images — at the Langley Teachers Association blogspot. Charlene Kantyluk shares that her grade 8 students from Shaughnessy Park School are excited to share a video that they produced after learning about the IRS system in Canada. I Promise from Shaughnessy Park on Vimeo. Halton Catholic students commemorate children of IRSs in Quebec, Northwest Territories, and Ontario. Learners in the Halton Catholic District School Board (Ontario) will be able to look back on a memorable day due to Aboriginal Liason Officer Sherry Saevil, who took the time and the energy to make it possible for over 60 students from across the Board to learn about the impact of the Residential Schools on Aboriginal peoples in Canada. Indigenous children who never returned home from going to Indian Residential Schools in Amos (QC), Fort Providence (NWT), Alexandra School for Girls (Toronto, ON), Cecelia Jeffery (ON), McIntosh (ON), and Spanish (ON) were all remembered through talk, ceremony, and action. Teacher Heather Poublon and her Native Studies students recently dove into Project of Heart to learn more about First Nation, Metis, and Inuit people’s experiences at the Indian Residential Schools. Creativity and excitement were the result in the classroom, as the students persevered in their attempts to get their local Member of Parliament to come to their school to address their concerns.